1. Please explain to the world who you are and what you do - introduce yourself! Japanese TOP drum'n'bass DJ, and is active based in WOMB, Tokyo. Started my career at BREAKBEAT SCIENCE, NYC in '96. Returned to Japan in '00. Appears on many top clubs worldwide such as FABRIC, THE END, NATION, PARADISE FACTORY IN UK, SIRENA, WARUNG, LOV.E in Brazil, including many clubs in asian nations. In 2006, launched own label, "06S Records". 2. You are the biggest drum & bass DJ in Japan, please tell us your story of how you achieved this. of my crew helped me to establish this position in the scene. 3. You love the UK scene. How is it different to the Japanese scene? What I think the differences are the crowds. UK crowds love and understanding in drum'n'bass a lot more. Also, the quality and volume of sound system of UK are lot higher than Japan. 4. How do the Japanese see the UK scene? Do they "understand" it? UK scene is the very home of drum'n'bass, and its funs in Japan respect and admire UK scene. If Japanese people, who like music, experience UK drum'n'bass scene, I am sure they can understand and people who experienced the UK scene actually drive the scene in Japan. I count on Japanese people who understand and love the scene more and more. 5. What DJs have you met from around the world? Please tell us about your meetings and your relationships with foreign drum & bass DJs producers. I have met almost all DJs, producers regarding drum'n'bass. Especially, D-Bridge gave me an advice on track making and did remix my first single released from 06S records. Moreover, from my label, FUTUREBOUND and SONIC also release their tracks. I received warm support from DJ MARKY when I did Brazil Tour, and in the last UK Tour, RED ONE from RAM RECORDS, and FABIO supported me a lot. 6. Vinyl Vs Digital... in the UK there has been HUGE debate about vinyl dying. Downloads are taking over and vinyl is being used less and less. What is your opinion about this? 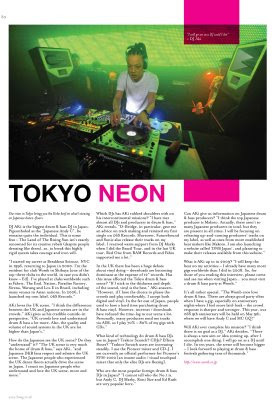 Has this issue affected the Tokyo drum & bass DJ scene? If I stick to the thickness and depth of the sound, vinyl is the best. However, I believe if I can please the crowds plus I can play comfortably, I accept both digital and vinyl. Far east island, Japan, had hard time purchasing drum'n'bass vinyl before, but internet/downloads have reduced the time lag to the world scene a lot. I, myself draw on AIM and many producers have sent me many tracks via AIM, so I use 70%-80% of my gig with CD. 7. What kind of technology do drum & bass DJs use in Japan? Traktor Scratch? CDJs? Effects Boxes? ⑦日本のdrum & bassDJはどのような機材を使用していますか？Traktor Scratch? CDJs? Effects Boxes? Traktor scratch user is increasing steadily, I use mixer and CD-J by pioneer. I am currently an official performer for pioneer's "SVM-1000", and doing Japan Tour for promotion while doing my DJ activities. 8. Can you describe the typical Japanese style of DJing drum & bass? Scratching? Mixing? Cueing? Selection? ⑧日本のdrum & bassDJの典型的なスタイルについて話してください。Scratching? Mixing? Cueing? Selection? There are many drum'n'bass DJs in Japan and their styles are vary. 9. Who are the most popular drum & bass DJs in Japan that are from UK, Europe and USA? I cannot tell who the NO.1 is, but ANDY C, DJ MARKY, RONI SIZE, and ED RUSH are very popular in Japan. 10. Who are the most popular / best / new Japanese drum & bass DJs? My favorite new-comer is VELOCITY. 11. What are your ultimate goals as a DJ? Where do you want to be in 10 years? There is no goal as a DJ. There is always new aim or idea coming up when I accomplish one thing. I will go on as DJ till I die. In 10 years, the scene will become bigger and I will success huge drum'n'bass festival gathering tens of thousands of crowds. 12. What are the goals of the typical Japanese drum & bass DJ? 13. Is it hard to break into the DJing scene in Japan regarding drum & bass? It is not easy for drum'n'bass to break into the DJing scene like as Techno and Electro. Though the scene definitely becomes bigger and bigger, and the situation and the position of drum'n'bass has always been changing. 14. Please give us some information of the drum & bass producers in Japan. We cannot seem to find any in the UK! What level is Japanese drum & bass at? Can you give us some good examples? Where can we buy it? and I expect MAKOTO and other up-coming producers future release. I will launch the website, "DNB JAPAN" in this Spring, and I am planning to evolve the release from this website. I will keep the heat on my activities even more, and this year, I will have many gigs worldwide more than last year. 16. Please tell us about the drum'n'bass policy in Womb. First of all, WOMB crew love drum'n'bass . That is why they have a strong passion to tell how good the drum'n'bass is, and because of this reason, we can party with top hot artists and also give a chance to Japanese local artists. 17. Please tell us honestly about how the public see drum'n'bass in Tokyo, and what kind of people like drum'n'bass here. Actually, Japanese media do not really focus on drum'n'bass, though it is one of the alternative as dance music genre. The funs are vary; from intelligent, sophisticated people to mad music funs.